Table traverse type CNC drilling / tapping machine. The most cost efffective and a rich variety models. 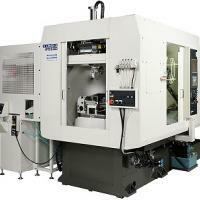 Column traverse type CNC drilling/ tapping machine with 180° rotating twin turntable. Series from NT30 with high speed spindle motor to NT40 with high rigid heavy duty machine is available. Slant spindle structure makes expanded loading space, it is ideal for various automated manufacturing line. Special loader is equipped as standard, it is easy to realize various kind of automation. 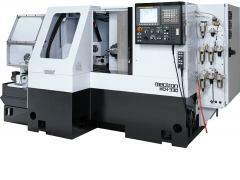 ワークの6面全加工を実現したマシニングセンタ 6 faces machining of workpiece in one machine.